In addition to my experiences with Elvis and JoJo, I knew crows had a reputation for being of superior intelligence. Whether it was the Japanese crows who waited until the traffic lights turned red to put walnuts under cars’ tires, flew to a perch and waited for traffic to start up again so the cars would crack the nuts for them, or the Caledonian crow that figured out how to make a tool out of a stick, crows were a brainy bunch. 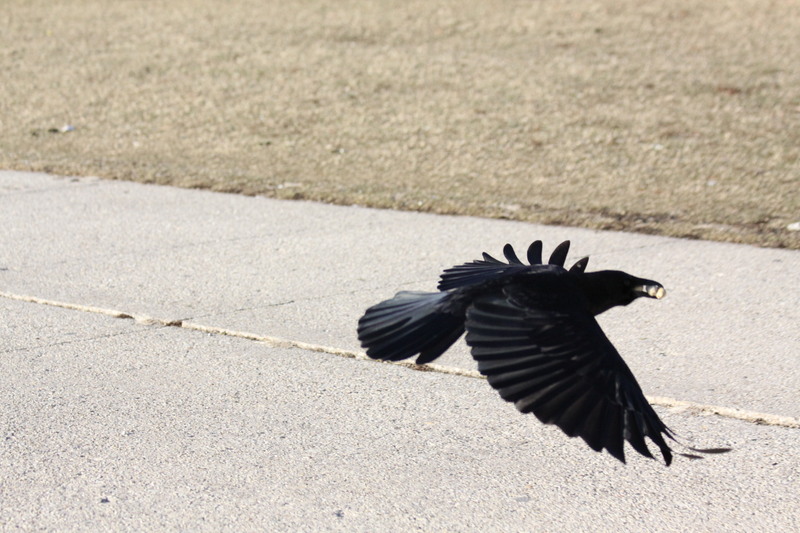 Before West Nile virus reached Chicago, the crows in the lakefront parks were numerous and they tended to ignore me. As I sat there hanging out with the pigeons and house sparrows, every once in a while a crow might show up out of curiosity, but it always hung back. I imagine I started bringing hot dogs every once in a while to see if that would do the trick. But if I threw something at them it scared them away. I tended not to throw food at birds anyway, but since the crows were on the perimeter it seemed the only way to reach them. And if it was summertime the gulls got all the hot dogs. A single gull can wipe out a quarter pound of hot dogs in less than 10 seconds, storing it all in its gullet. Of course the crows had a plan for me. The way I remember, it took me four years to get their trust. The way they remember it, they had to convince me that if I wanted to feed them, I should quit feeding the pigeons, starlings and house sparrows. This coincided with the fact that I was becoming more interested in other birds, including the migrant species that visited twice a year. My study of pigeons, starlings and house sparrows, all the “invasive” species, was complete enough. I followed the crows’ advice and began feeding them exclusively. The usual fare was hot dogs and peanuts. In the winter sometimes I made them peanut butter oatmeal raisin cookies, which I call the Birdz Cookies, although they’ve become a people favorite too. In 2002 there were only a few crows left after West Nile virus had killed so many, and I felt terribly sorry for them. Crows have quite an elaborate social structure, and it was the equivalent of losing your tribe. 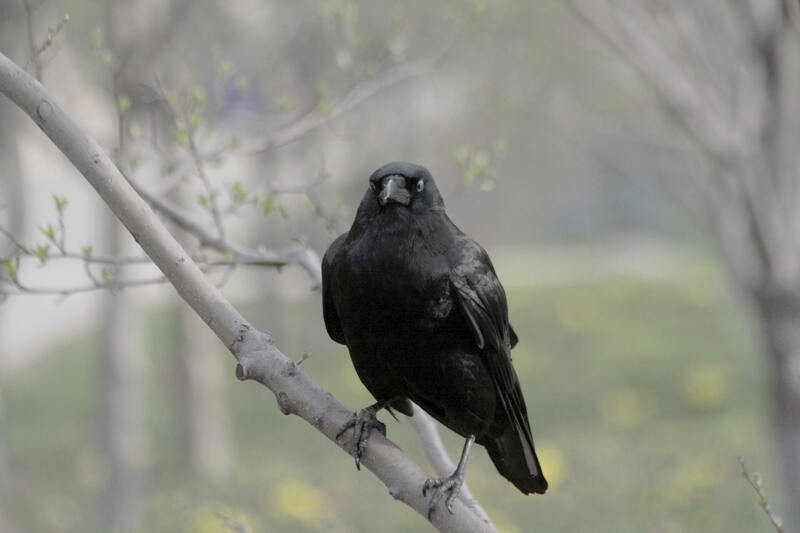 (Kevin McGowan of Cornell University has done a tremendous amount of study about crow society.) In the dead of winter I sought out the remaining crows, fed them and spent time with them, just letting them know, as I had with JoJo, that I cared. It proved to be the big bonding moment, I guess. The crows adopted me. I was still thinking music should be part of the bargain, but I couldn’t carry my piano or even a guitar downtown to play music for the crows or the other birds. At one point I bought a couple of recorders with the idea that I would learn how to play them and serenade the birds. It never happened. Invariably when I paid attention, the birds were in key with my inner soundtrack, but it still wasn’t the same as playing for them. I did start singing last year, “There is nothing like a crow” to the music of “There Is Nothing Like a Dame” from South Pacific. “There is nothing like a crow. Nothing in the world. I think all of you should know, there’s not anything like a crow” or some such thing. I could start singing and the crows would show up. But now they’re looking for me anyway, I don’t try to find them anymore. There were always adjustments to be made. For instance, in the late spring and summer, the lakefront is full of Ring-Billed Gulls and they outnumber the crows, so I had to be careful where I fed the crows. It seemed to be a mutual decision, that I would put their food down under a leafy tree, close to other trees where there was less open space, since gulls by nature preferred to be out in the open. I honestly do not remember thinking this myself, it was like an epiphany that came from the crows, it seemed to be their suggestion. This is only a problem when I have hot dogs or cookies. The gulls’ beaks are unable to deal with peanuts in the shell. They will pick them up and put them right back down again. The crows always recognize me, without fail, and they can pick me out of a crowd. (John Marzluff of Washington University has done experiments that verify this phenomenon). I cannot count the times I have been walking on the street during rush hour and a crow will call out. I’ll look up and there it is, either flying over, or perched somewhere above the intersection where I’m standing. I have to stop and laugh. I know they’re probably just saying hi to the Food Lady but I like to think the crows consider me an honorary crow or they can somehow see my Inner Crow. It’s difficult to sum up a decade of crow experiences here, so I will revisit this subject from time to time. Suffice it to say that I have developed a relationship with these incredibly clever birds and I treasure it. I willingly acknowledge they are much smarter than I am. They have trained me well. I would never think of showing up in the park without something for them to eat. I call it paying my Crow Tax. But it’s a small price to pay for the experience of getting to know these fascinating creatures, and to somehow, on some level, inhabit their world. This entry was posted in birds, Crows, interspecies communication, Uncategorized by Lisa Rest. Bookmark the permalink. Wonderful! Charming! I love it. Thank you for sharing. Just found your crow page…. i to like them. they are spiritual birds. they even have funerals. Blackbird, Crow, Raven. May they live and thrive. Thank you for the human and spiritual account. Also glad you found the page and from time to time my crows return.